A GOAL from Julius Sniauksta in the sixth minute of the second half of extra time finally broke the challenge of Boherbue Comprehsensive School from Mallow in Cork and won Ballybay Community College their first ever All-Ireland title and the Masita Rice Cup at the Hawksfield Centre of Excellence in Kildare on Saturday. Sniauksta was only on the field a matter of minutes, but he found himself in the right place at the right time to live up to his “supersub” moniker and complete a turnaround that saw his team apparently in trouble before the extra time break. Three Boherbue points in a row, two from Gerry O’Sullivan and the other from Cormac Curtin, were the only scores in extra time until Aaron Mulligan popped over a late free to leave it 0-14 to 1-13 at the change of ends. Mulligan hit two more pressure frees on the re-start to level the game for the sixth time before the sub’s intervention and Boherbue could only add a late free from O’Sullivan with play switching from end to end and the game finishing in a welter of excitement. The Danske Bank O’Doherty Cup champions were the the better team over the opening 20 minutes after Mulligan got them going with two early frees. An excellent team move in the 5th minute ended with Jack Curtin stabbing home a goal for the Cork team, but Ballybay were back into their stride quickly with points from Daragh Dempsey (2), Mulligan and Michael Coyle to go three clear after 15 minutes. That deservedly went to 0-8 to 1-2 after 22 minutes, but Boherbue finished the half strongly with points from O’Sullivan (free), Alan O’Connor and Thomas Casey and the teams went in at the break on parity at 0-8 to 1-5. Although Dempsey opened the scoring with a point in the 32nd minute, Ballybay only added one more score before the midway point of the half when Thomas Casey landed three points in a row to edge the Munster side into the lead. Again Ballybay responded with a point from Dempsey and two from Mulligan and it looked as if the Monaghan side were in the driving seat. But the play was switching from end to end and Boherbue were looking very dangerous. In fact Casey should have found the net in the 57th minute, but Shane Black brilliantly turned the shot over the bar and a minute later Gerry O’Sullivan landed the equaliser. Overall this was an excellent game of football with a number of players catching the eye including the McPhillips boys at the back, Joel Wilson, Daragh Dempsey and Dara McCann for Ballybay and O’Sullivan, Casey and Killian Murphy for the Cork side. 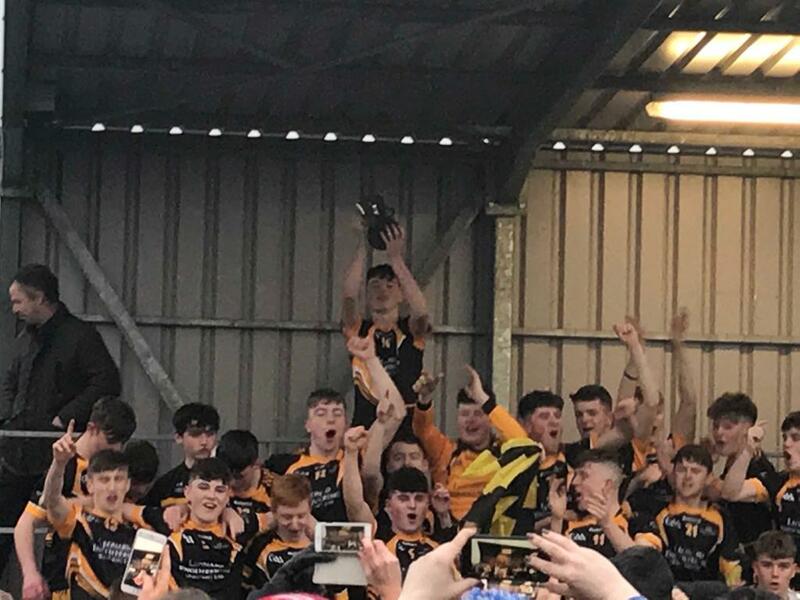 However when a cool head was needed Aaron Mulligan provided it and his contribution of nine points went a long way to ensuring that the Edmund Rice Cup joins the Danske Bank O’Doherty Cup in the Ballybay trophy cabinet.